Discussion in 'Pin Zaps & Swaps' started by timeerkat, Jan 13, 2019. This ZAP thanks is quite a bit overdue, but back when the Sword in the Stone park packs were released, I was trying to complete the set. After some trades all I had left to find was the fish transformation pin. @LittleBird messaged me saying if I didn't mind a flawed pin I was welcome to hers. Well, it turns out it wasn't flawed after all (just a bit of extra glaze that came off after poking at it) but she zapped it to me anyway. 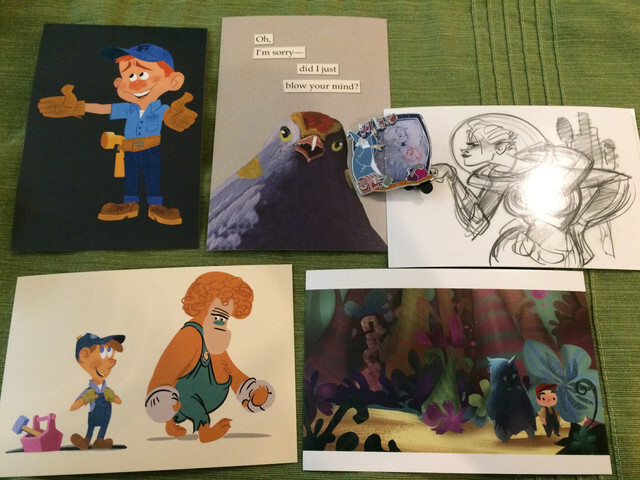 On top of the pin, she also zapped me several Wreck-it Ralph postcards with concept art of my boo and his boo, Felix and Calhoun! Thank you very much, LittleBird! Booger1964, TinyTink, MerlinEmrys and 8 others like this. Aww those prints are so cute! Congrats! Congrats on the zap. Those postcards are great. Yes, the bird card is awesome! Wuuuttttt I have never been blessed with a bird card from Kim. Scam!!!! Congrats on the zap, Tessa, and yay for completing the set! bcol and MerlinEmrys like this.